Most professionals and managers are aware of two flavours of busy. Productive busy. Working towards important goals, or spending time on a mission critical project, either for the business or a client. The other flavour is unproductive busy i.e. work that creates very little value for anyone. Stress usually accompanies this kind of busy. Company culture and operational practices shape the employee experience. In turn, this influences whether staff are busy and productive, or unproductive, busy, and stressed. Consequently, teams who don’t spend much time focusing on what matters struggle to retain and recruit new staff. Evidence is mounting that employees with a poor work-life balance – as a result of inefficient processes – are less productive. Revenues and profits will suffer compared to positive workplaces i.e. the ones that generate higher profits according to numerous studies. Managers reading this, who relate to these issues, would benefit from considering some of the ways you can review operations and policies, to increase employee satisfaction and improve retention. Are You Focused on Efficiency? #1: Do job descriptions correlate to actual work being done? This kind of mission creep happens to many a job role over time. Sometimes, this is a result of a client project or necessary pivot in operational needs. Other times, this is a sign that employees are spending too much time on the wrong tasks, such as paperwork and admin. Health and safety, training and asset management tasks are usually included in that list. Although most job descriptions allow a version of “any other related tasks required”, this boilerplate text is a poor excuse that drags down productivity. Sure, admin – including health and safety compliance – is necessary, but can this be done more efficiently? This question needs exploring further. #2: What is the knock-on effect of too much busy work? A manager’s role is to manage: to review, provide feedback, motivate, and ensure team members have the right resources to succeed. Staff sending through piles of paperwork need to know they are doing the right thing, even when it isn’t directly contributing to productivity. This consumes more management time, therefore getting in the way of projects with a higher ROI. Compliance with health and safety, and other applicable laws is a legal necessity. However, this is something many businesses could undertake with greater efficiency. Employee engagement is a hot topic for HR professionals. Disengaged team members have a serious bottom-line cost. According to studies by the Queen’s School of Business and Gallup, low employee engagement scores result in “18% lower productivity, 16% lower profitability, 37% lower job growth.” This contributes to voluntary turnover at a rate of 50% higher than lower stress environments. Companies that score higher enjoy “100% more job applications.” Putting it simply: stress costs money. Staff are less productive, have more accidents and make more mistakes. One way to reduce stress is to evaluate what they are spending time on and ensure they can focus on what matters. Want to increase operational efficiency and reduce compliance burdens? 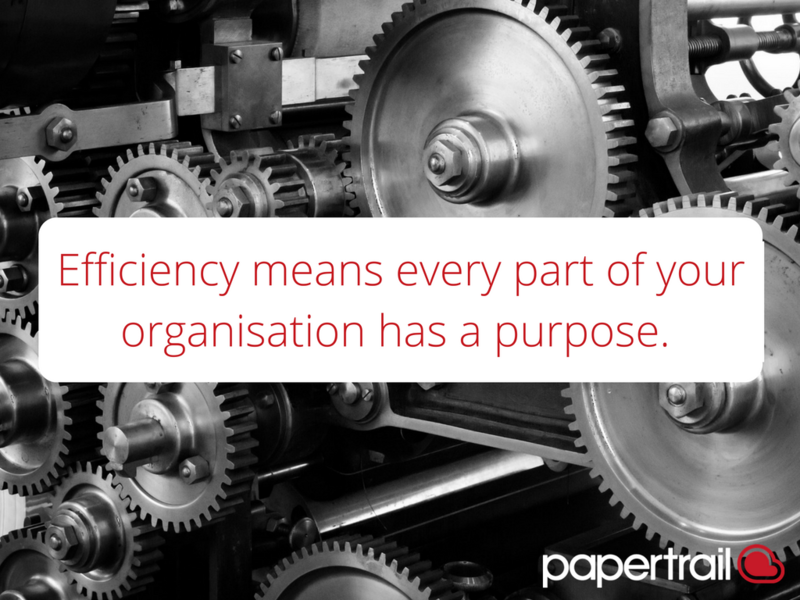 Contact us today, and see how Papertrail can help your organisation.